Mgbody Magnesium Spray Advanced Sports Blend is made with essential oils that helps reduce post-workout muscle pain and inflammation. With a pleasant scent and instant stress relief, Advanced Sports Blend is the perfect recovery solution for all athletes and active bodies. 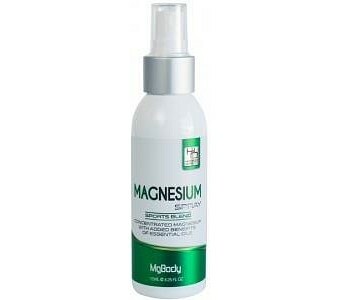 100% Australian certified organic product Contains magnesium and essential oils that reduces muscle pain and inflammation after work outs and sports activities Fits perfectly into your purse, gym bag, and carry-on 100mg of magnesium for 8-10 sprays 32-34% concentration of magnesium Ingredients: Magnesium chloride, essential oils of eucalyptus, rosemary, cajeputt, lemongrass, and peppermint.